Modern farmhouse decor comes from the original, widely known farmhouse style. Farmhouse style was born of the need for hard working and hard wearing homes for farming families. There were farmhouses in every state of the US and across the world. Every style icon of Farmhouse comes from a need, and then softened and made pretty by creative wives and daughters. (Sorry guys, back then, few men were decorating… ) Apron sinks, white cabinets, wood plank walls, big porches… all these things were necessary. But farm families weren’t only about utility. They sewed airy curtains and planted flowers just for cutting, they reused mason jars for pretty purposes, and they kept their front porch swept clean just in case a passing neighbor stopped over to cool off with a glass of lemonade. You can all see it, right? What is Modern Farmhouse Decor? Modern farmhouse decor takes the best parts of farmhouse style, and makes it more simple. Farmhouse style is homey, lovely and reminiscent of a simpler time. Modern farmhouse has taken over the decorating shows and Pinterest, and has transformed a once outdated style into something trendy and hot in the decorating world. So what makes a project “Modern Farmhouse”? Wood planking and wood trim. Neutral color palette with lots of texture. Mixing in more modern pieces to “shake up the place”, with vintage finds. 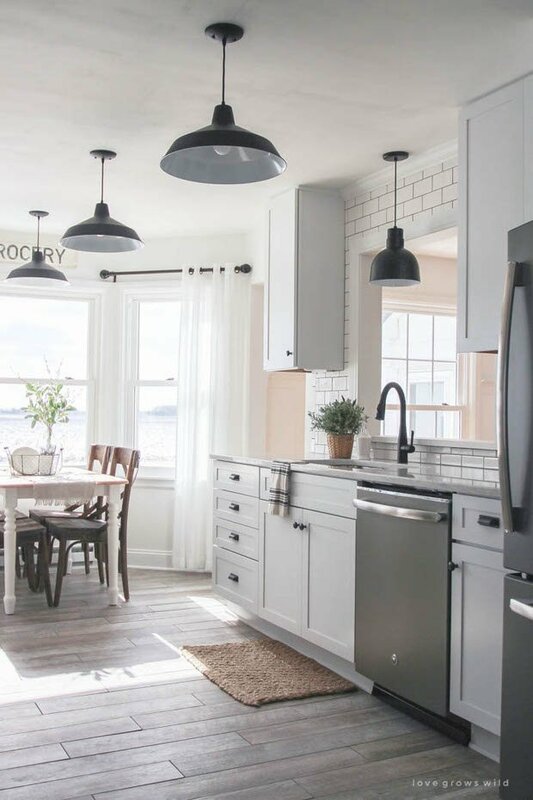 So, if you want in on the hottest modern farmhouse style right now, here are some great tutorials to help transform your place! Our first project is a bunch of projects! Liz at ‘Love Grows Wild‘ (long been one of our fav blogs!) 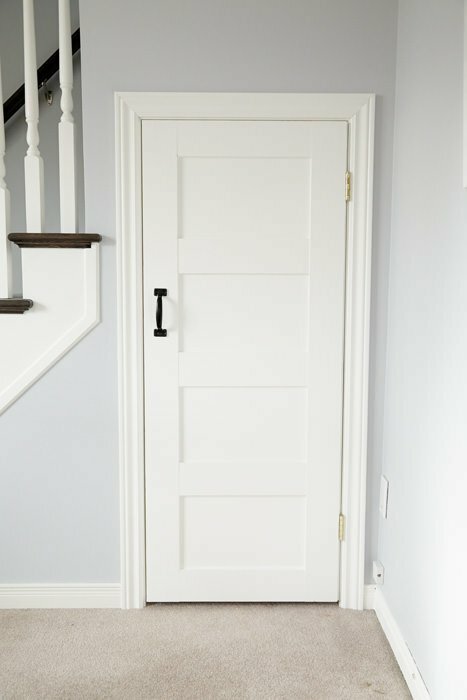 did a modern farmhouse kitchen makeover, complete with before and after photos. You have to go look at this kitchen, and check out her projects. Have to. Be sure to scroll down to the bottom to find the links to all the individual projects. 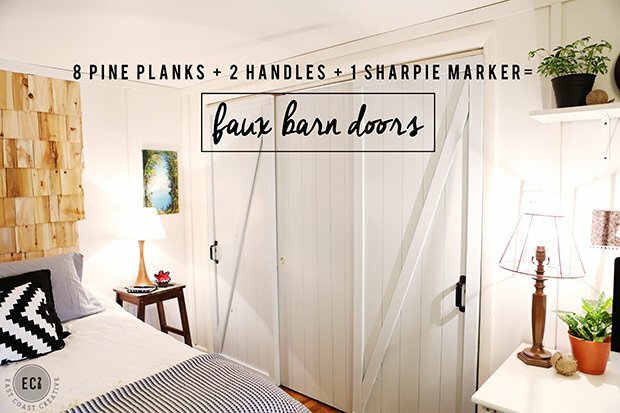 DIY faux barn doors are a great place to start when developing a modern farmhouse style. Monica from ‘Easy Coast Creative‘ has a full tutorial for you, and these were made from simple hollow core doors. 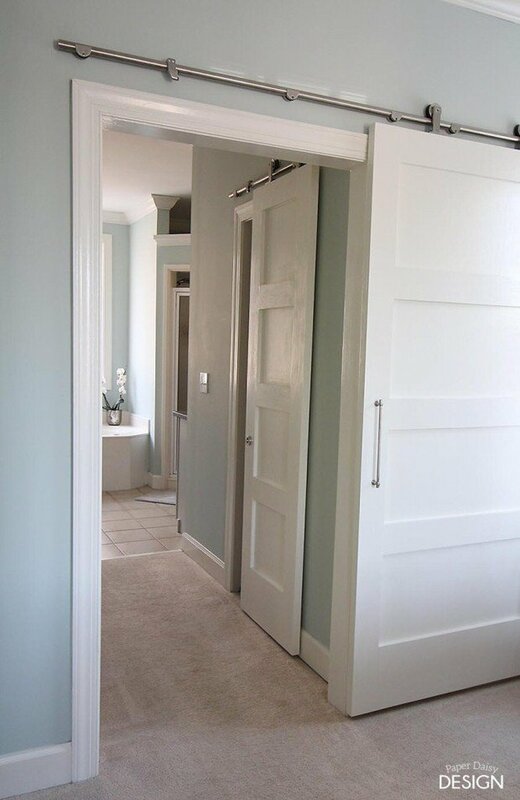 ‘Jennifer Squires‘ took a plain, flat door and made it into a DIY shaker door with wood trim. As she says, charming yet modern! 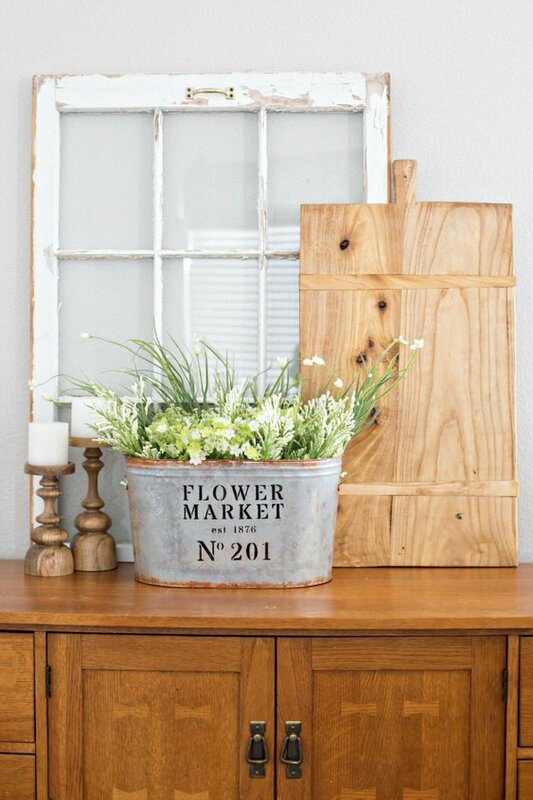 Kimberly at ‘A Night Owl‘ has a tutorial for this amazing and pretty DIY flower market bucket that looks just like a vintage find. You can find these buckets at any place they sell floral supplies… then just follow her instructions for the modern farmhouse charm! Again from ‘Love Grows Wild‘ (we told you it was one of our favs!) 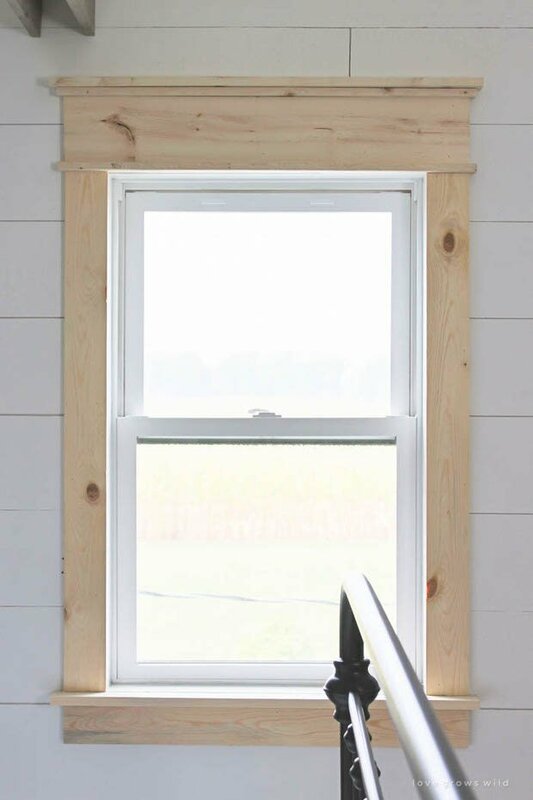 learn how to make farmhouse window trim, for around $10 per window! Wood trim is an essential element of the modern farmhouse style. Got a small house? Of course you do, or you wouldn’t be on DYSS! That’s ok, ’cause ‘Addicted 2 Decorating‘ has this DIY modern farmhouse bedroom project I just have to have. I especially love the desk that also works in this small room, as my new office in our next house will be a dual guest room as well. 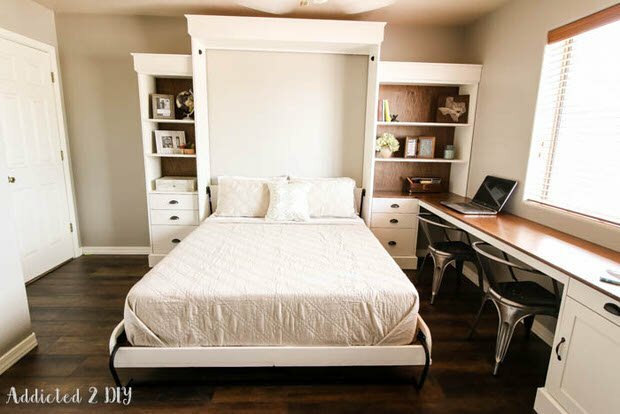 Go jump on over to our post on DIY murphy beds for more ideas! 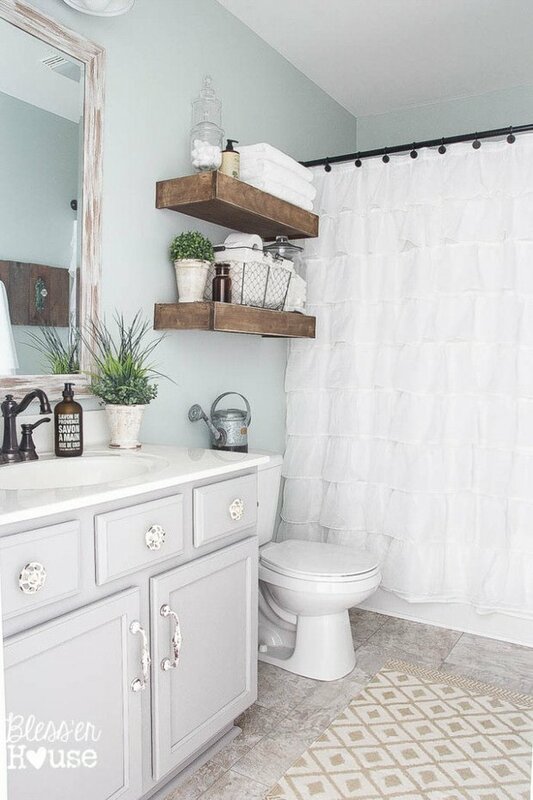 Lauren from ‘Bless’er House’ has a modern farmhouse bathroom makeover that will pretty much blow you away… after which you will be taking notes and making lists. She has a bunch of projects throughout this makeover, but the before and after really say it all! 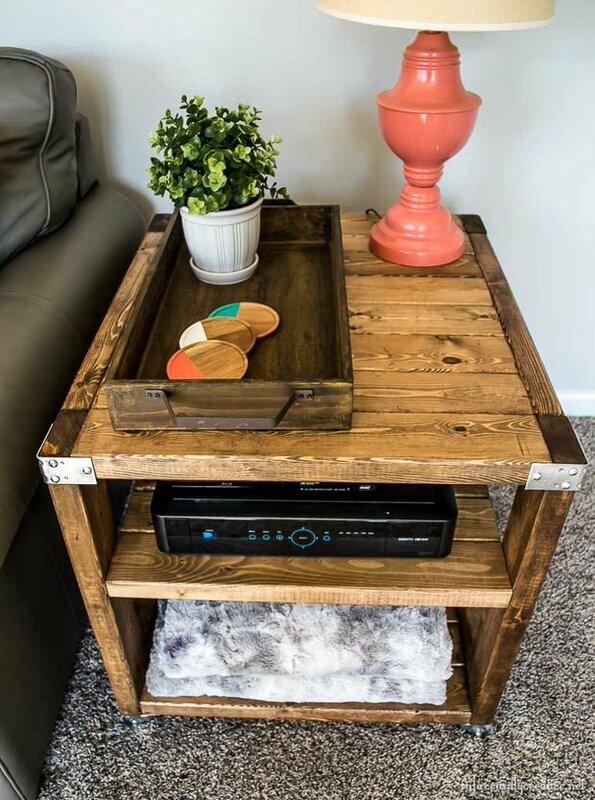 Add a little industrial style with this DIY end cart made for $20 from Beckie at ‘Infarrantly Creative‘. This is simply 2×4’s and some metal casters. She has free downloadable plans for this modern farmhouse decor as well. From ‘Paper Daisy Design‘, these sliding barn doors were made from scratch from plywood, and were a great solution to an awkward space. They also have a link for finding the hardware they used, and even a tutorial on how to install that as well. I love how they brought in a more modern touch by using the more contemporary handle. Finally, if you want to make major modern farmhouse style impact, learn how to DIY a modern plank wall from ‘Bigger Than the Three of Us‘… This isn’t a difficult project, yet it takes a boring sheet rocked wall into new territory. 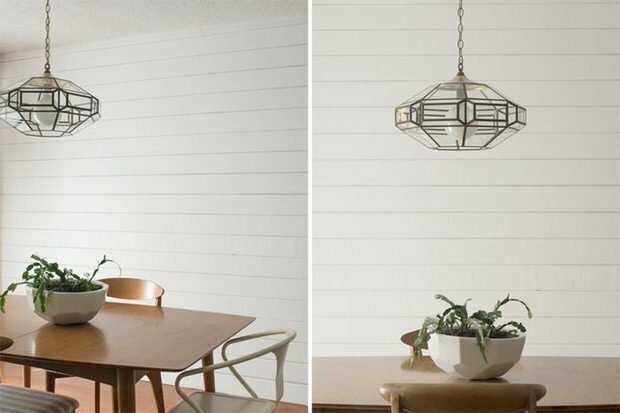 Ok, now you have some great ideas for DIY Modern Farmhouse Decor! So jump right on over to 10 Creative DIY BeadBoard Projects or Stone and Brick Accent Wall Projects!